We are running for wishes! Wishes are more than just a nice thing. And they are far more than gifts, or singular events in time. Wishes impact everyone involved - wish kids, volunteers, donors, sponsors, medical professionals and communities. The impact varies. For wish kids, just the act of making their wish come true can give them the courage to comply with their medical treatments. Parents might finally feel like they can be optimistic. And still others might realize all they have to offer the world through volunteer work or philanthropy. Whatever the odds, whatever the obstacles ... wishes find a way to make the world better. 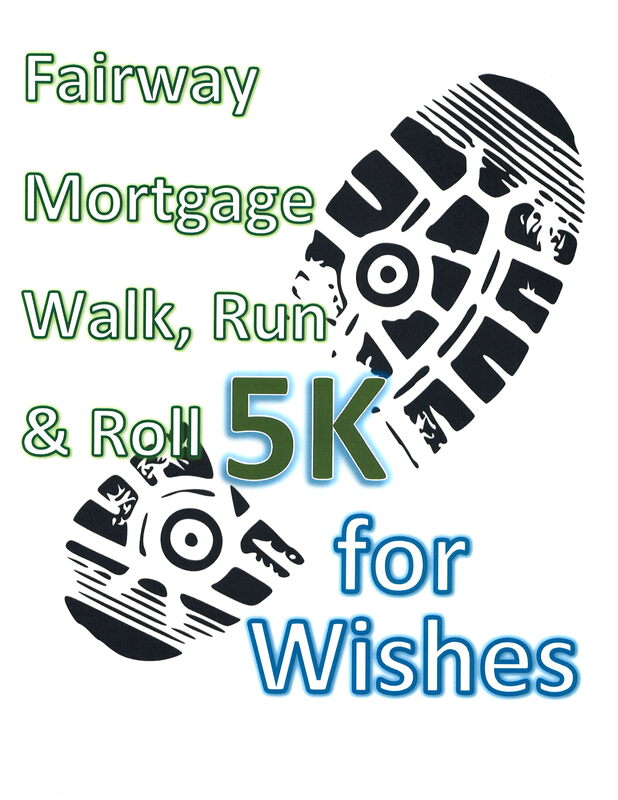 Please join us for The First Annual Fairway Mortgage 5K Walk for Wishes. All 5k registrations include t-shirt, timing, and registration packet. Date: Sunday, May 15th, 2016 Start Time: 9:00 AM Location:Lemansky Park (22 Brayman Street, Auburn MA, 01501) 5K FEES: You may choose to sign up as an individual runner OR create a team. Individual runners: $25 before March 30th OR $30 Late registration after March 30th Suggested donation goal for individual runners is to raise $100 Teams:(10-15 people per team) Flat fee of $100 Platinum: Raise over $2000.00 Bronze: Raise $500 Gold:Raise over $1500.00 Blue: Raise $250 Silver: Raise over $1000.00 Timing: All 5k runners will be timed by? Packet Pickup Location: Fairway Mortgage (783 Southbridge Street, Auburn, MA 01501) or asked to be mailed. Awards: Awards will be presented to the top male and female overall, top male and female masters, and top male and female in the following age divisions: 10 & under, 11-19, 20-29, 30-39, 40-49, 50-59, 60-69, 70 and over. This is the first central Massachusetts walk for wishes that will be held and we hope for it to be a great turn out. All proceeds benefit Make-A-Wish of Massachusetts and Rhode Island. It will be an amazing day with post race food, live entertainment and much more. Help make a childs wish come true each step of the way.